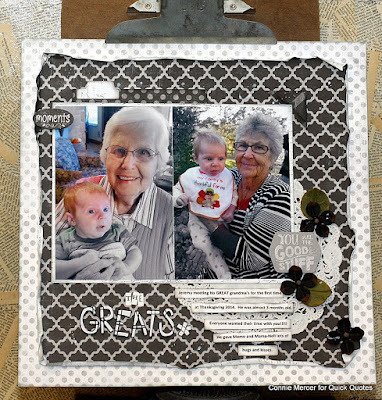 Hi, Connie here with a scrapbook page using the 49 Shades of Grey Collection by Quick Quotes. This is a great collection of black, grey and white color tones that work perfect with the other collections by Quick Quotes. The inside page has a special edge and I wanted to share with you how that was done. #1. Cut a half inch off two adjoining sides. Making the paper 11 1/2" X 11 1/2". #2. 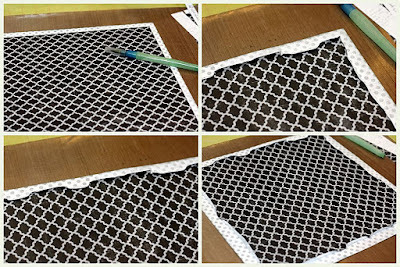 Adhere to the 101 (grey polka dots) paper, leave about an inch from the edge with no adhesive. #3. Take a water pen and run a line of water along the edge with no adhesive. #4. Fold and bend the wet paper. Do all the edges the same way. #5. When the edges are dry, ink for shading. Makes for an unique paper edge and holds the ink well. #6 Title and journal page.